When I first got started online I couldn’t understand why I was only making one or two sales a month? When I went to live events and seminars there seemed to be all sorts of people there who were selling hundreds of products a week!! What was I doing wrong? In late 2008 I finally figured it out, I chatted to loads of successful people and I also chatted to loads of unsuccessful people and I very quickly realised what the missing piece of the puzzle was. Today I have made a video explaining exactly what I discovered and how I implemented this to make a full-time living online. 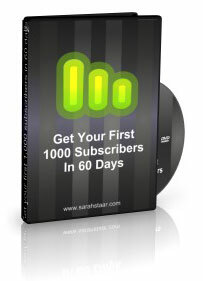 Get your first 1,000 subscribers in 60 days. I am just in the process of recording the videos and will make this bonus available to anyone who buys Ezine Academy. To Claim your bonus send a support ticket with the subject Bonus. I bought Ezine Academy some months ago after watching Sarah interview Martin on video. It’s one of THE BEST courses I have ever bought, and I highly reccomend it to ANYONE who wants to learn email marketing. For years I thought about creating a newsletter, but had NO idea how to go about it. Martin’s course will show you exactlay what to do and how to do it! I now successfully publish a weekly newsletter, and I could not have done it withouth Martin’s course. Nice that Sarah is getting you a discount for Easter, but in truth, this course would be a bargain at five times the price. It’s that good! Hi Sarah, thanks for the video, on quick question that is kind of related. I’ve noticed recently that you seemed to have switched to a new autoresponder. I know before you spoke about the importance of picking a good autoresponder company, and that you had to switch to getresponse, and it wasn’t the easiest thing to do, so it’s best to pick a good one from the start. So I’m wondering if you could give us some insight into why you switched from Getresponse to Office Autopilot? Problems with getresponse, cheaper option, etc… ?? I’m going to be picking one soon so just trying to get some feed back before I decide. Sarah always makes informative videos, I am dyslexic as well and love the way she uses videos to communicate with her subscribers. I know other marketers who also recommend how good Martins course is. Building a list and more importantly building a relationship with your subscribers is a sure fire way to build a solid business online. A question about Ezine Academy, does Martin show us how to get the traffic needed to get 100 or even 600 people to subscribe, in the course? Martin includes a bonus pdf Quickstart Guide, Getting Your First Subsciber. Get your first 1,000 subscribers. I am just recording the videos at the moment and will make this bonus available to anyone who buys Ezine Academy. yes i have switched autoresponder company, next week I am going to make a video all about why i switched autoresponder. Martin Avis has produced a very comprehensive course in Ezine Academy. He writes in a gentle, relaxed, homely way, which is very engaging. I have published newsletters since I set up my business 20 years ago, and written hundreds of thousands of words, but I still found some great tips in Martin’s course which I can use right away. If you want to grow your internet marketing business, your most important asset is your list. If your emails are boring then people won’t open them and read them; they also won’t forward them to their friends.